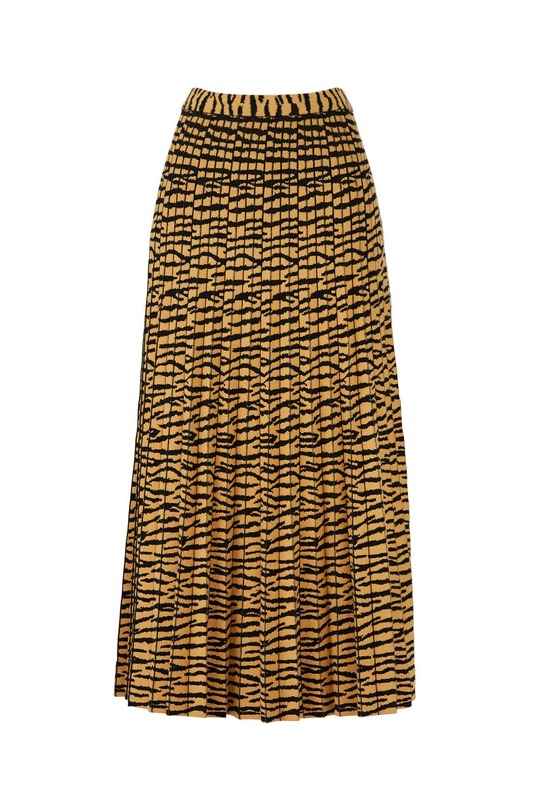 Tiger stripes make a fierce fashion statement on this Proenza Schouler midi skirt finished with a little swing. Yellow and black animal printed jacquard (77% Viscose, 22% Polyester, 1% Nylon). Skirt. 36" from waist to hemline. Imported. Fashion forward - trendy and super comfy!! 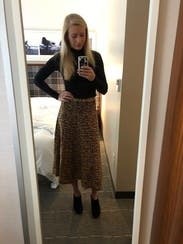 I normally stray from knit skirts but this skirt is perfect...no tight band at the waist, easy zipper on the side and perfect length! Not super heavy and extremely versatile! 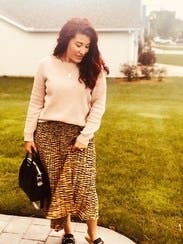 This knit-skirt was so cute that even in 100 degree weather I had to rent it! Wore to work with a basic top and heels and it was perfect for the office. It does have a side zipper and is pretty stretchy so if your between sizes Id size down. Can't wait to rent again when the weather cools down to wear on a weekend. 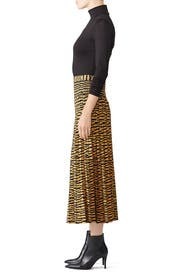 On trend knit skirt. 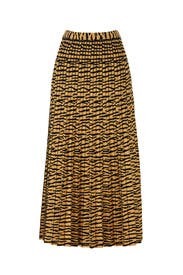 Zipper instead of an elastic waist makes this skirt flattering. 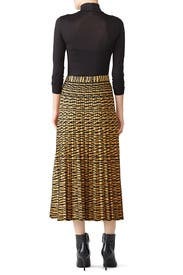 Very cool skirt, would rent again for a nice dinner or special occasion. Fabric was heavier than expected, would not recommend wearing in the summer -- too hot. But perfect for fall or winter. Small was a little tight but not uncomfortable due to the elastic in the waist. Skirt has a lot of fabric so glad I got the smaller size, even if it was a little snug. Great skirt. Heavy but great fit. This skirt looks so cool and has so many styling possibilities. I got tons of compliments on it and I thought it was really flattering. Super heavy material. Hits at a weird spot. I am 5'8'. Love everything about this skirt! The waist is a bit large, but that worked fine for my body type. The pattern and cut are great- feels as expensive as it is! Beautiful skirt. Eye catching. I wore it with tights and boots and a black knit top. Nice heavy weight. Flattering fit. The skirt has a good weight to it. It was perfect for a chilly fall night. It took me several months of trying to get this beautiful skirt home but I finally did and I am really enjoying it. Beautiful quality and eye-catching details I think it fits true to size maybe a tiny bit small but it does have some give in it. Heavy knit fabric but not too warm I've worn it both inside and outside with no trouble, really versatile even though it's kind of dramatic it goes with almost any top. 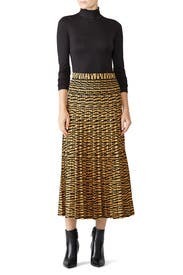 I wish I could afford to buy this skirt I would in a second if I could. 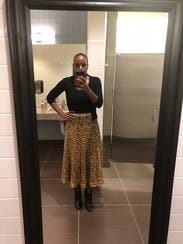 Super fun skirt that you can definitely wear in the winter (it's a sweater material). It's very flattering and moves nicely. The waist band is stretchy, but I would not recommend that you size down. Get your true size and then enjoy the stretchy-ness :). I got a size down (based on some of these reviews) and regretted it. Overall, a great skirt that was a ton of fun to wear! Loved this skirt! The fabric is thick and comfortable, making it perfect for winter or spring. The waist is elastic, adding to the comfort! It's great for a date or just a day hoping around town.